There’s no faulting David Carberry’s ambition in his attempt to create a commentary and response to Dostoevsky’s Notes from the Underground through the medium of circus. The resulting piece, Sediment, created with co-performer Alice Muntz and choreographed by Chelsea McGuffin, combines circus thrills with an intense sense of alienation. Sequences are performed without the usual pizazz and presentation – or the consequent applause. Whether it is an unresolved Cutting the Woman in Half (Carberry hauls Muntz’s legs off stage, leaving her head trapped), an exciting acrobatic duet or a bottle-balancing act, each adds to the sense of dislocation. 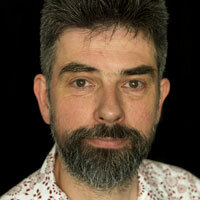 The circus routines themselves are fragments of Carberry’s imagination. Muntz emerges from behind a backlight gauze and Carberry initially struggles to find a way to explain the events that happened between them. The action is, by and large, wordless (a TV set provides the occasional scrolling quote), with amplified sound and Carberry’s playing of prepared instruments adding atmosphere. 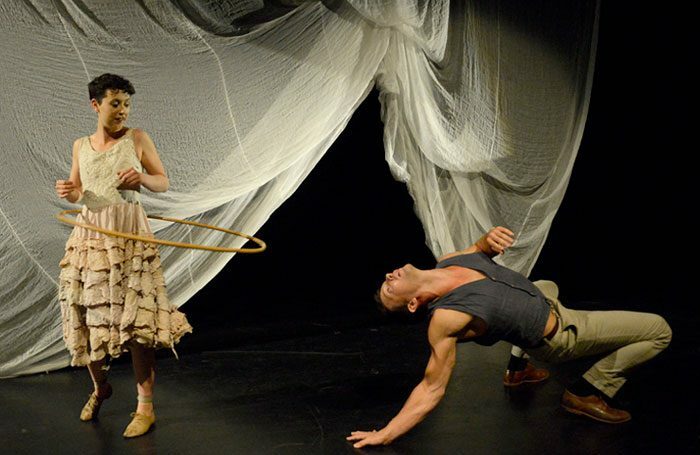 The circus routines, which often demand intense mutual support, allow the two performers to create elements of characterisation, notably his disdain for her. But you get the feeling that their characters’ real depths are as opaque to each other as they are to the audience.